Michael Albert DePiano was born July 1, 1955 in Turnersville. Mike stood a shade under 6 feet and developed a powerful build as a teenager. He began boxing at 14 and won 23 amateur fights before turning pro in 1973. MIke trained in Philadelphia and was managed by his father, Jimmy. He fought under his mother’s maiden name, Rossman. There was some question as to Mike’s date of birth, with some claiming he was born in 1956. If true, this would have meant his first few pro bouts were fought under age, at 17. Mike was a hard puncher who earned the nickname The Jewish Bomber. He fought with a Star of David embroidered on his trunks. Mike won his first 13 professional fights before a draw with Nate Dixon. He won his next eight, including a TKO over Mike Pinney, who was undefeated in 27 fights at the time. 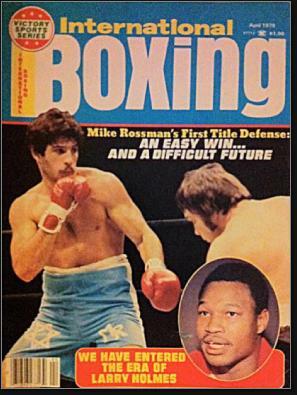 In 1978, Mike got his first title shot, climbing into the ring against Victor Galindez to decide the WBA Light Heavyweight championship in the Louisiana SuperDome. Mike shocked the sport with a 13th round TKO, opening cuts over both of Galindez’s eyes. Mike successfully defended his crown with a TKO over Aldo Traversaro, but lost a rematch to Galindez in April of 1979—breaking his hand during the fight. He originally injured the hand in a 1977 victory over Gary Summerhays. The Rossman–Galindez rematch had originally been scheduled for February, but was cancelled at the last minute because of a dispute over judges. Mike was literally waiting in the ring when the fight was called off. After winning their second meeting, Galindez refused to grant Mike a rematch. Mike continued to fight for four more years, winning eight of his final 10 bouts to finish with a record of 44–7–3, with 27 knockouts. One of those losses came in 1981 to Camden’s Dwight Braxton, who was on his way up as Mike was on his way down.